In October, 2015, Albany deployed 100 Walk [Your City] signs at 16 intersections to promote the city’s heritage and walkability. 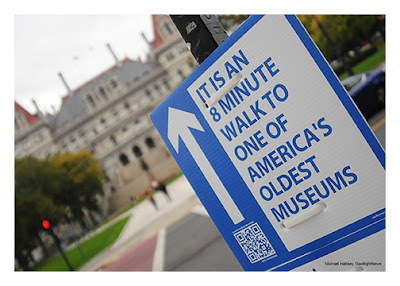 In May, the Albany Roundtable will welcome the founder of Walk [Your City] as its Visiting Speaker. Matt Tomasulo, “Chief Instigator” behind Walk [Your City], an emerging civic platform that helps cities put people first and embrace walkability through online tools, will be the featured speaker at the Albany Roundtable’s Annual Meeting on Wednesday, May 18, 2016. The event is open to the public, and will be held at the National Register-listed University Club of Albany, 141 Washington Avenue at Dove Street. The meeting will take place from 6:00 – 8:00 p.m., and will feature a social hour with cocktails and hors d’oeuvres, a short update on the Albany Roundtable Civic Luncheon Series, the presentation of the Good Patroon Award, the presentation the Albany Roundtable Scholarship for Civic Leadership, and a talk by the Visiting Speaker. Tickets are $40 and include light fare and open bar. Matt holds a dual masters degree from UNC Chapel Hill and NC State in City & Regional Planning and Landscape Architecture where he was recipient of the Wings on Wings award, the Robert Stipe Fellowship, and 3 national Student ASLA awards. Professionally, Matt has earned national and international recognition for his work in design and development, winning the Urban Land Institute’s Hines Urban Design Competition, Public Interest Design’s Global Design Award, and CORE77’s DIY Design Award. He has successfully funded two Kickstarter projects totaling $48,000 from 1,500 backers and is a Next City Vanguard, a “40 Under 40” class of new urban leaders. Major sponsors for the event are The Capital District Transportation Committee and The Capital District Transportation Authority; with additional support from the Society of Architectural Historians, Turpin Bannister Chapter. Planners should note that this event has been approved for 1.0 AICP certification maintenance credits. Walk [Your City] grew out of Walk Raleigh, a catalytic guerrilla wayfinding project that spread to hundreds of communities around the globe. WalkRaleigh was included in the 13th Venice Biennale and Tomasulo’s work has received numerous accolades and been featured by BBC News, TED.com, The Atlantic, Bloomberg, Fast Company, NPR and many others. The Albany Roundtable’s previous Visiting Speakers have included Dr. Mindy Thompson Fullilove, author of Urban Alchemy: Finding Joy in America’s Sorted Out Cities; Kaid Benfield (People Habitat: 25 Ways to Think About Greener, Healthier Cities); Jeff Speck (Walkable City); John Norquist (CEO, Congress for the New Urbanism); Janet Flammang (The Taste for Civilization); Colin Beavan (No Impact Man), Jaime Correa (planner, architect and professor at the University of Miami) and others. Tickets for the reception must be purchased by Monday, May 16. For more information, email albanyroundtable@yahoo.com or call The University Club at 518-414-3555.